Why are we Homo sapiens so keen to attribute the world's oldest cave art to Neanderthals when there's stronger evidence to suggest that art came from us? Why do Neanderthals so fascinate Homo sapiens? And why are we so keen to exaggerate their virtues? It is political correctness gone prehistoric. At every opportunity, people rush to attribute "human" virtues to this extinct human-like species. The latest generosity is to credit them with the first true art. A recent redating of cave art in Spain has revealed the oldest paintings in Europe. A red dot in the cave El Castillo has now been dated at 40,800 years ago – considerably older than the cave art of Chauvet in France and contemporary with the arrival of the very first "modern humans", Homo sapiens, in Europe. This raises two possibilities, point out the researchers. Either the new humans from Africa started painting in caves the moment they entered Europe, or painting was already being done by the Neanderthals who were at that moment the most numerous relatives of modern humans on the European continent. One expert confesses to a "hunch" – which he acknowledges cannot be proven as things stand – that Neanderthals were painters. That hunch goes against the weight of the existing evidence. Of course that hasn't stopped it dominating all reports of the story: as far as media impressions go, the Neanderthals were now officially the first artists. Yet nothing of the sort has been proven, and plenty of evidence suggests that the traditional view is still far more likely. In this view, the precocious development of art in ice age Europe marks out the first appearance of modern human consciousness, the intellectual birth of our species, the hand of Homo sapiens making its mark. One crucial piece of evidence of where art came from is a piece of red ochre, engraved with abstract lines, that was discovered a decade ago in Blombos cave in South Africa. It is at least 70,000 years old and the oldest unmistakable artwork ever found. It is also a tool to make more art: ochre was great for making red marks on stone. It comes from Africa, where modern humans evolved, and reveals that when Homo sapiens made the move into Europe, our species could already draw on a long legacy of drawing and engraving. In fact, the latest finds at Blombos include a complete painting kit. In other words, what is so surprising about the idea that Homo sapiens started to apply these skills immediately on discovering the caves of ice age Europe? It has to be more likely, on the face of it, than assuming these early Spanish images are by Neanderthals in the absence of any other solid evidence of paintings by them. For, moving forward a few thousand years, the paintings of Chauvet and other French caves are certainly by us, Homo sapiens. And they remind us why this first art is so exciting and important: modern humans did not just do dots and handprints but magnificent, realistic portraits of animals. Their art is so superb in quality that it proves the existence of a higher mind, the capacity to create civilisation. Is it possible that Neanderthals also used pigment to colour walls and also had the mental capacity to invent art? Of course it is, but the evidence at the moment still massively suggests art is a uniquely human achievement, unique, that is, to us – and fundamental to who we are. Let's face it, modern humans don't like ourselves very much. We feel all manner of shame, anxiety and guilt about where we are going as a species. This urge to big-up the Neanderthals is a symptom of our self-loathing. An archaeologist says he has found the oldest piece of rock art in Australia and one of the oldest in the world: an Aboriginal work created 28,000 years ago in an outback cave. The dating of one of the thousands of images in the Northern Territory rock shelter, known as Nawarla Gabarnmang, will be published in the next edition of the Journal of Archaeological Science. The archaeologist Bryce Barker, from the University of Southern Queensland, said he found the rock in June last year but had only recently had it dated at the radiocarbon laboratory of New Zealand's University of Waikato. He said the rock art had been made using charcoal, so radiocarbon dating could be used to determine its age; most rock art is made with mineral paint, so its age cannot accurately be measured. Barker said the work was "the oldest unequivocally dated rock art in Australia" and among the oldest in the world. The oldest known rock art is in Spain, where hand stencils and red discs made by blowing paint on to the wall in El Castillo cave are at least 40,800 years old, according to scientists using a technique known as uranium-thorium dating. Sally May, an archeologist from the Australian National University who is not involved with Barker's research, said his find was "incredibly significant". "I don't think it will surprise anyone that rock art is that old in Australia because we know people have been here a lot longer than that, and there's no reason to believe they weren't producing art," she said. Barker said he had found evidence that the cave where he found the rock art had been occupied for 45,000 years. How To Be An Explorer of the World (Amazon) -- I want to take this course on design anthropology but this book, the assigned text, looks like an excellent second best. So Much For The Paperless Society (Beta Knowledge Tumblr) -- graph of the waxing and waning use of bond paper in North America. Spoiler: we're still using a lot. You scale content businesses by increasing the number of people who create the content ... or so conventional wisdom says. Learn how a former author is using software to simulate and expand human-quality writing. Ironclad digital privacy isn't realistic, argues "Privacy and Big Data" co-author Terence Craig. What we need instead are laws and commitments founded on transparency. Solon Barocas, a doctoral student at New York University, discusses consumer perceptions of data mining and how companies and data scientists can shape data mining's reputation. Genevieve Bell, director of interaction and experience research at Intel, talks about how anthropology can inform business decisions and product design. Genevieve Bell, director of interaction and experience research at Intel Corporation, says when she approaches technology she is "less interested in thinking about the piece of technology itself and more interested in the kind of work that technology is trying to do and the larger context in which it finds itself." In the following interview, Bell discusses her experience as a "Thinker in Residence" and how anthropology concepts can be used to make tech more consumer centric. You were an Adelaide "Thinker in Residence" for South Australia. What does that involve? Genevieve Bell: The South Australian government over the last seven years has invested in a program to bring preeminent thinkers from around the world to tackle the problems of the future of the state. I was the first Australian, which was very odd. But over the years, they've brought people to Australia to think about things like water security, supply chain management, juvenile justice, homelessness, urban planning, public transportation systems, and early childhood development. The government has implemented recommendations from those thinkers that have ranged from changing how they do supply chain management to introducing childhood development learning centers in schools. My task was to help think about what was going to be the role of information and communication and entertainment technologies in the future of South Australia and, indeed, Australia more broadly. It ended up happening that this project took place against the backdrop of a much larger national debate about the role of broadband. The project had an interesting focus on looking at what the barriers to adoption and the drivers to high-speed broadband were going to be in South Australia. In order to come up with some sort of solid recommendations in that space, I chose to do something quite unusual for this project and in this program — I went and did fieldwork. I spent about two months traveling in South Australia. I think I logged about 12,500 kilometers by the time I was done — I went through two state fleet vehicles; they'll never forgive me for that. I talked to people in about 45 different communities that ran the gamut from remote aboriginal communities to urban centers. It gave me a sense of what made South Australians tick, and it helped me find out what they care about. I also did a piece of ethnographic research with the government itself to work out how the government functions and how it thinks about things. For me, it was really about trying to think through this question: If you were in government, what would you do — what would you need to do — to make the state a good place for broadband to happen? It wasn't just about getting households connected. It was about capacity building, both in the citizenry and in the state. I asked people to participate in our website with me — send me pictures of the technological stuff in their lives, tell me about it and I would respond to that. We also did a massive postcard drive — I knew I couldn't ask everyone to get online and talk to me, so we distributed free postcards and asked people to mail them back. We generated a whole lot of postcards as a result of that. The report is available online for download from the SA Stories site and from the Thinker's website. The government is in the process of inducting — and has already inducted — some of the recommendations and it's debating the others. It was actually a really inspiring, exciting process. I was incredibly fortunate that one of the things that Intel lets you do after working there for seven years is to take a sabbatical. Most people, sensibly I would say in retrospect, choose to spend that as down time. I seem pathologically incapable of having downtime, so I decided I'd go to work for someone else in that period. Intel actually was very kind about letting me go and do that and giving me the space to have a different moment of intellectual work. And I did, in fact, come back to Intel very differently energized as a result of it. What parts of your anthropology background do you find particularly applicable to technology issues and solutions? Genevieve Bell: As an anthropologist, one of the things that's really useful is that we're trained to think at a systems level. We're trained to think about things holistically. When it comes to me approaching technology, that means I'm less interested in thinking about the piece of technology itself and more interested in the kind of work that technology is trying to do and the larger context in which it finds itself. And for me, it's always about being able to ask this larger set of questions. I'm really interested in getting at the critical distinction between what people say they're doing and what they're actually doing. A lot of technology development is really focused on what we think people should do or what we imagine they're doing or what they tell us they're doing. The reality is often something completely different. What techniques do you use to get at that reality? Genevieve Bell: The first principle is fieldwork. I'm a big believer in actually going to the places where technology is being produced and consumed, and spending time with people in their lives to get a sense of what they care about. For me, that means you have to be able to ask bigger questions about what people value. I'm really interested in seeing what life is actually like, not what we hope it looks like. How has your team made Intel a more consumer-centric company? Genevieve Bell: Out of sheer force of will and being stubborn. That's never a good answer, but it is, in fact, one of the answers. I think we've done it partly out of persistence and out of a vision that said we knew that what people wanted could change the way Intel made things. Before my current job, which I've been in for about a year, I spent five years working in our consumer electronics business. Part of my role there was to transform what had been a quite traditional Intel business into something that was much more consumer centric. Part of how we drove that kind of different thinking was literally going and spending time with people all over the world in their homes. We made different decisions about what we built and what we didn't based on the feedback we were getting from consumers, not just customers but consumers. I'm really proud of that work because we actually transformed the way the company — and that piece of the company — thought about itself and what it was doing. When anthropology is done right in business, it can change the way a company thinks about itself and what it values. That's the stuff that endures. Along with ancient flakes of charcoal, researchers found a "high water mark" on the shells' inner wall, evidence that an unknown liquid, probably urine or water, was added to make the paint more fluid. The remarkable discovery, reported in the journal Science, throws light on the capabilities and rituals of Homo sapiens who occupied the cave from at least 140,000 years ago. The cave's entrance was blocked by sand 70,000 years ago. "This is the first known instance for deliberate planning, production and curation of a compound," Christopher Henshilwood at the University of Bergen told Science, adding that the finding also marked the first known use of containers. "It's early chemistry. It casts a whole new light on early Homo sapiens and tells us they were probably a lot more intelligent than we think, and capable of carrying out quite sophisticated acts at least 40,000 to 50,000 years before any other known example of this kind of basic chemistry," he added. Henshilwood's team said the tools were evidence for an "ochre-processing workshop" run by early humans, who gathered the colourful mineral oxides from sites about 20 miles away. One of the artists' kits came with a slender bone from the front leg of a dog or wolf. One end of the bone had been dipped in ochre, leading the scientists to conclude it was used as a primitive paintbrush. "You could use this type of mixture to prepare animal skins, to put on as body paint, or to paint on the walls of the cave, but it is difficult to be sure how it was used," said Francesco d'Errico, a study co-author at the University of Bordeaux. "The discovery is a paradox because we now know much better how the pigment was made than what it is used for." Tiny grooves at the bottom of the shells may be scratch marks caused by sand grains when the artist mixed the paint with a finger. "From time to time they were scratching the bottom when their finger was moving some of these little grains," said d'Errico. "Twenty thousand years after these painting kits were left behind, humans at Blombos were certainly using pigments for symbolic purposes. It is clear they knew all the sources for these red and yellow pigments. This was a tradition for them," said d'Errico. // Originally from Recombinant Records: Amusing Ourselves to Death, adapted from Amusing Ourselves to Death: Public Discourse in the Age of Show Business by Neil Postman. Taken from the text to the yt video. // S'étant toujours effacée derrière son oeuvre, Hannah Arendt demeure l'une des philosophes les plus mystérieuses du XXe siècle. Nombre de ses amis eux-mêmes ne connaissaient que l'une ou l'autre des facettes de sa personnalité. De cette femme dont la vie a été marquée par de nombreuses ruptures et recommencements, ce documentaire dresse un portrait à partir de tous les témoignages disponibles dans son oeuvre, dans les images d'archives de ses interventions publiques mais aussi dans les souvenirs de ses proches dont certains racontent pour la première fois "leur" Hannah Arendt. Hier gibt es das Gespräch Arendt / Gaus (1964) in voller Länge!! Pierre Fargeas, a former aircraft technician from France, shared a unique film footage of daily life in Guinea Bissau from 1969-74 on Youtube. The BBC Radio 4’s In Our Time has just produced an episode about Robert Burton's 17th masterwork The Anatomy of Melancholy; the book is essentially a 17th Century multi-disciplinary investigation of what was then known as melancholy, and, as the BBC describes, brings together "almost two thousand years of scholarship, from Ancient Greek philosophy to seventeenth-century medicine. Melancholy, a condition believed to be caused by an imbalance of the body’s four humours, was characterised by despondency, depression and inactivity. Burton himself suffered from it, and resolved to compile an authoritative work of scholarship on the malady, drawing on all relevant sources." Can't wait to give this a listen! You can listen to the episode by clicking here. Found on the Advances in the History of Psychology website; click here to read full post. Anbieter der kostenlosen Touren ist in diesem Fall eine US-amerikanische Kirche, die sich in der Stadt auch in anderen Projekten sozial und getrennt davon auch missionarisch betätigt. Bei den Organisatoren der Touren handelt es sich überwiegend um amerikanische und kanadische Rentner, die die Wintermonate in Mazatlán verbringen oder sogar immer dort leben. Meist ist es eine Mischung aus Abenteuerlust und humanitären Ambitionen, die vergleichsweise gut situierte Touristen auf Slumtour gehen lässt – um von ihrer Luxusenklave mit Golfklub und Strand aus den ebenso streng abgeriegelten Slum zu besuchen. A macabre collection of bone cups made from human skulls, unearthed in a Somerset cave, are the oldest of their kind, researchers believe. The extraordinary vessels are the handiwork of early modern humans, who used stone tools to prepare and finish the containers around 14,700 years ago after the last ice age. The three cups, made from the skulls of two adults and one three-year-old child, were dug up several decades ago, alongside the cracked and cut-marked remains of animal and human bones at Gough Cave in Cheddar Gorge, south-west England. They have now been re-examined using new techniques. The human bones show clear signs of butchery, implying that the bodies were stripped for meat and crushed for marrow before the heads were severed and turned into crockery. There is no suggestion that the cups are trophies made from the remains of dead enemies. It is more likely that making skull cups was a traditional craft and their original owners died naturally. "It would probably take a half day to prepare a skull cup," said Silvia Bello, the palaeontologist who led the study at the Natural History Museum in London. "Defleshing the skull was a skilled and lengthy business." Researchers said it was impossible to know how skull cups were used, but historically they have held food, blood or wine. Some are still used today in Hindu and Buddist rituals. "To us they can still seem a little strange," said Bello. "I wouldn't have my cereal in one." Writing in the journal Plos One, the scientists describe revisiting excavated remains from the cave, including a skull cup unearthed in 1987 by Chris Stringer, head of human origins research at the museum. Detailed examination of 37 skull fragments and four pieces of jaw using a 3D microscope revealed a common pattern of hard strikes followed by more finessed stone tool work that turned a freshly decapitated head into a functional cup or bowl. "This is the first time we've understood how this material was processed, and the fact that the skulls were not just cut and butchered, but were shaped in a purposeful way," said Stringer. The discarded human bones had the same cut and saw marks found on butchered animal bones at the site, and some were cracked open or crushed, as was done with animal bones to expose nutritious marrow. Only the skulls seem to have been treated with special care. The cuts and dents show they were scrupulously cleaned of any soft tissues soon after death. "They systematically shaped the skulls to make them into cups. They scalped them to remove the hair, they removed the eyeballs and ears, they knocked off the faces, then removed the jaws and chiseled away the edges to make the rims nice and even. They did a pretty thorough job,' Stringer said. The smaller cup, made from the child's skull, would have leaked because the cranial bones had not fully fused together, but the larger two might have carried food or around two pints of liquid. "We assume it was some kind of ritual treatment. If there's not much food around they may have eaten their dead to survive. Perhaps they did this to honour the dead, to celebrate their lives," Stringer added. The cave dwellers were among the first humans to return to Britain at the end of the last ice age. The island was unpopulated and almost completely under ice 20,000 years ago, but as the climate warmed, plants and animals moved across Doggerland, a now submerged land bridge that linked Britain to mainland Europe. Where food went, early humans followed and brought art, craft and toolmaking skills with them. The ages of the remains at Gough Cave suggest it was home to humans for at least 100 years. The cave is well-sheltered and, with skin flaps over the entrance, would have made a cosy abode, Stringer said. The residents were ideally placed to hunt passing deer and wild boar, while up on the Mendip Hills roamed reindeer and horses. In the 1900s, several hundred tonnes of soil were removed from the cave to open it up as a tourist attraction, a move that may have destroyed priceless ancient remains. The skull cup and other bones unearthed in 1987 survived only because they were lodged behind a large rock. In 1903, field researchers working in the cave's entrance uncovered Cheddar Man, the oldest complete skeleton in Britain at more than 9,000 years old. 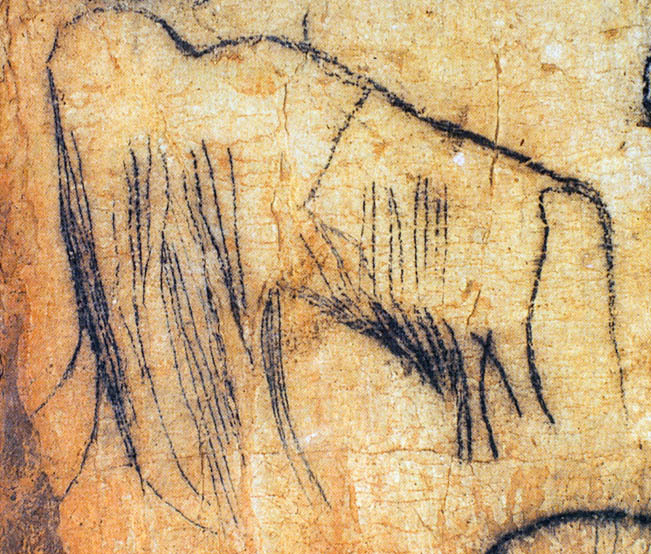 A painting of a mammoth was found on the wall in 2007. Other artefacts from the site include an exquisitely carved mammoth ivory spearhead. A precise replica of one of the skull cups, complete with cut marks, will go on display at the Natural History Museum in London from 1 March for three months. Some of the current Mercedes models do not have dipsticks. If the oil level gets low, the owner is sent an email. It is important to understand that there has been no high-tech development that makes it no longer important to stay on top of oil consumption and leakage. With enough miles, oil is still consumed, and it will still leak; running low on oil will still trash the motor. There is nothing magical about Mercedes, though such a superstition is encouraged by the absence of a dipstick. The facts of physics have not changed; what has changed is the place of those facts in our consciousness. Mental and bodily involvement with the machines we use entails a kind of agency. Yet the decline of such involvement, through technological accretions intended to make our machine less obtrusive, is precisely the development that makes for an increase in autonomy. Is there a paradox here? Not having to futz around with machines, we are free to simply use them for our purposes. There seems to be a tension between a certain kind of agency and a certain kind of autonomy, and this is worth thinking about. In particular, there is a tension between autonomy understood as the limitless choice of an unfettered self (let’s call this freedomism – the anthropology that is tacit in much advertising) and the kind of agency that is exercised in any skillful performance.